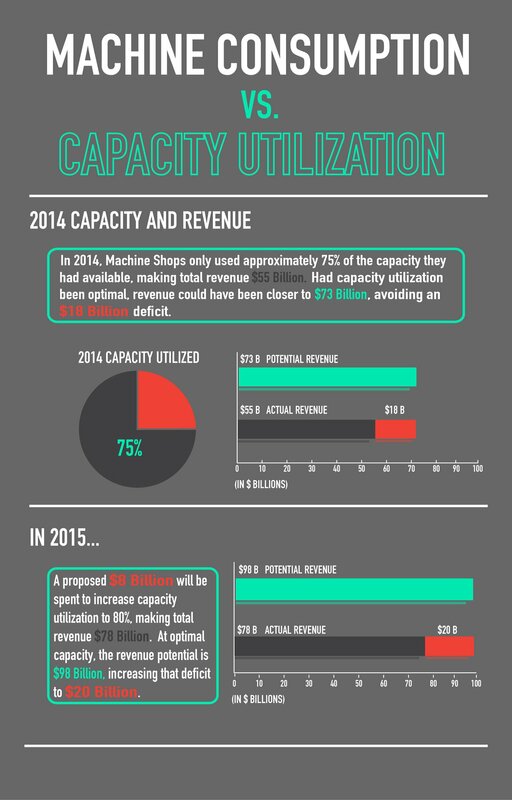 CAPACITY UTILIZATION IS THE KEY TO INCREASING BOTTOM LINES. We’re making more, so we need more machines to continue making more. This is the thinking that drives current industry spending trends. Seems simple. Production is up, so capital equipment purchasing must increase. It makes sense; until you consider one critically paramount parameter: capacity utilization. Which, by the way, is not optimal. Consider, last year machine shops in the US made approximately $55B using 75% of the machine capacity they had available. If this was medical school, that would be a C student. It’s certainly not an F, but it certainly isn’t an A either. Had operations been running at an optimal level, revenue would have been closer to $73B; meaning what actually happened in 2014 was an $18B deficit. For 2015, another $8B is proposed to be spent to increase our amount of machines by 34%. Let’s say we achieve 80% capacity utilization. That should increase revenue to approximately $78B, a $23B raise from last year, right? Wrong. It actually proposes a $20B deficit, $2B more in the hole than last year, because the potential revenue would be closer to $98B. The point is, instead of boasting about the US being number one for machine consumption this year, let’s boast about our potential to make more money by running our machines at optimal levels. Let’s increase our efficiency so that this $8B being spent isn’t in vain and we see our revenue almost double instead of making close to what we could have made with the machines we already owned. Hey Aerospace! Your orders are projected to increase by 387% this year. Auto parts manufacturers are leading the way in capacity utilization, running at an impressive 88%. Why don’t you fill up automotive’s other 12%? You know that the machines are the same and they can make your parts too, right? Do you know why automotive is doing so well? More product lines. They understand today’s consumer and they are adapting. They’re reshoring and beginning to understand the need of a flexible, distributed manufacturing model closer to the consumer. They are starting to see that the “Cloud for Manufacturing” isn’t a mythical unicorn, it is a real tool; a tool that enables a single source of real time data. Data like available machine hours. Why does MakeTime care so much? For starters, we have one die hard mission: to make domestic manufacturing more efficient. For closers, we’re building a marketplace for all of those available machine hours and making it easy for you to buy them and fill up every nook and cranny of available capacity in this country. Last count was 3.4M+ available hours. What are you waiting for?